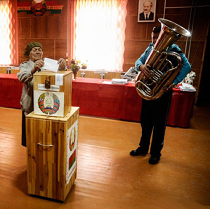 BelarusDigest > All > Belarus Presidential Elections: Will They Actually Count the Votes? On 11 October, Belarus will hold presidential elections. The Belarusian authorities try to create an image of democratic elections at a time when Alexander Lukashenka looks weak due to the economic recession. Realistically no one expects a fair vote count. The official results will be produced to bring victory to Alexander Lukashenka. But there are three things that can significantly change the perception of the campaign: access to the vote count, the number of votes against Lukashenka and the post-election period. These elections differ from the 2006 and 2010 presidential elections. Although the nature of the political regime remains the same: a small amount of opposition in election commissions, forcing students and civil servants to vote in advance or lack of system liberalisation, many minor improvements have actually taken place. According to the Belarusian Association of Journalists, an independent influential NGO, state media have not shown the Belarusian opposition in an extremely negative light as they did before. Previously, it looked unbelievable that Belarus Today, the regime’s main propaganda newspaper, gave an opposition candidate an opportunity to speak without censorship. Tacciana Karatkevich, the only democratic candidate on the ballot, had an online conference at Belarus Today on 24 September. In general, the authorities made ​​some concessions during the campaign. The most important was the release of political prisoners, but also the regime turned a blind eye to massive opposition rallies in Minsk city centre. The protest against the creation of a Russian airbase in Belarus, which took place on 4 October, gathered about 500 participants. If before election day in 2006 hundreds of democratic activists ended up under arrest, this year the authorities have not arrested a single activist helping Karatkevich’s campaign. But these changes will look cosmetic, if the authorities count votes as before. Usually in Belarus observers are not allowed to see the actual vote count (the author personally observed several elections in Belarus and will be an observer this year). This causes many to doubt that the vote-counting is fair. If the government continues as if it were business as usual, then these elections will fail to meet democratic standards. But according to some sources the authorities plan to allow international observers to watch the counting of votes. If the OSCE mission sees the vote count at least in most places, it will be forced to admit gradual changes in Belarus. That will further improve Belarus’ relations with the West. It seems that for many Belarusians the electoral campaign just started this week. A few major Belarusian independent web-sites confirmed to Belarus Digest that so far the overall traffic on their web sites has not grown. Several civil activists have criticised the opposition during the period for collecting signatures, stating that they have not seen a single picket of democratic candidates. When journalists ask ordinary people about the elections, many of them seem uninterested about the topic. The opposition has done much to cool the temperature of Belarusian society about the elections. On the eve of the elections, the democratic forces split into three camps. Firstly, those who participate in the elections. Tacciana Karatkevich, an activist of the Tell the Truth campaign, became their candidate. Secondly, those who advocate a boycott of the elections. And third, those who decided to stand aside and do not conduct a campaign. Despite the boring campaign, Belarusians could turn away from Alexander Lukashenka for a number of reasons. Belarus remains in the middle of the deepest economic crisis under Lukashenka’s rule. He seems reluctant even to lie about finding quick and easy solutions for the recession. Moreover, many Belarusians may be tired of the man who has ruled Belarus for over 20 years. This leaves plenty of opportunities for Tacciana Karatkevich. According to sociological data of the Independent Institute of Socio-Economic and Political Studies, she had 17,9% support among Belarusians a month before the election and may gain 25% of votes on 11 October, if the ballots are actually counted. Therefore, several things are worth watching. Firstly, how many votes the authorities will allocate to Karatkevich and other candidates,such as Siarhei Hajdukevich and Mikalai Ulakhovich, who are unpopular candidates promoted by the authorities. If their total percentage comes above 20%, this would indicate that the regime admits that it is losing popularity. Public opinion shifts are another thing to watch. If opinion polls show that Karatkevich and other candidates have much support, it will show a big change in the country. It will show that despite the internal problems of the opposition and a boring presidential campaign, Belarusians still want a change in the country. Only after the elections will it become clear to whether the campaign started a long-term trend of giving more space for the opposition or serves only the short-term benefits of the regime. The presidential campaign in 2010 also gave many reasons for optimism, but ended in the most massive repression in the history of Belarus with hundreds of people arrested, including several presidential candidates. The authorities still can return to the usual routine, especially if Karatkevich receives many votes. 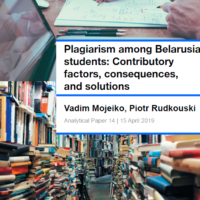 Like in 2010, the authorities may get scared of the opposition’s success, so it further undermines the organisational potential of democratic forces in Belarus. But if the authorities are wiser this time and refrain from cracking down on mass protests and using state media to slander the opposition, it will become a chance for Belarus to improve relations with the West in the long run. The opposition’s reluctance to hold mass protests after the elections makes the task easier for the Belarusian authorities. On Sunday, a rally against Russia's military bases in Belarus took place in central Minsk. This national security issue has become a major theme before the presidential elections next Saturday. And not only inside the country. Moscow keeps leaking information on the base and putting pressure on Minsk. The situation reminds one of the history of the establishment of the Single System of Air Defence of Belarus and Russia in 2009. Minsk managed to delay its creation for years and the system still does not function. Minsk dismissed information about Belarusians providing military technical support for the Syrian government. Meanwhile, Belarus has been again accused of arming the Syrian opposition and it has been reported that Belarusians helped transport French military cargo for France's intervention in Syria. Plans for Russia's Military Base: Déjà Vu? Russia wants Belarus to immediately accept the Russian airbase and Lukashenka to clearly side with the Kremlin in its current confrontation with Ukraine and the West. The Russian media campaign continues to put pressure on Minsk. On 27 September, Russian newspaper Nezavisimaya Gazeta reported that the agreement on the Russian airbase in Belarus might be signed by the Defence Ministries of the two countries in October and the base, located in Babruysk​, would function as quickly as January 2016. According to Nezavisimaya Gazeta, the base will include a regiment of Su-27 fighter jets, one air flight of Su-27 trainer jets and one squadron of Mi-8 transport helicopters. It is unknown whether Moscow is going to pay for the base. The newspaper believes that such a rapid deployment of the base is a response to America's possible deployment of new nuclear arms in Europe. Minsk and Moscow signed the agreement on establishing the Single Air Defence System in 2009. Then Minsk for years successfully delayed ratification and the coordination of details. Formally, the governments announced the establishment of the system in 2012. Recently it became known that the system still does not function. The head of the Chief Staff of Aerospace Forces of Russia Pavel Kurachenko​, on 8 September announced that the Single System of Air Defence would start working by the end of 2016. Army Refused to Buy from National Industry? On 9 September 2015 Belarus signed with a Russian manufacturer a contract about purchasing BTR-82A,armoured personnel carriers for the Belarusian army. Minsk will get them in 2016. It means that the government for unknown reasons has decided to dismiss alternatives offered by Belarusian defence industry. Belarus produced in recent years at least two similar types of machinery to the one Minsk bought. First, is the Kobra-K, which is a thorough modernisation of the Soviet BTR-70​ designed jointly by the Belarusian Barysau 140th Tank Repairment Works and two Slovak firms. Second, is the Umka MZKT-590 100 designed by the Minsk Wheel Tractor Plant (MZKT). Certainly, both these products represent the first attempts by Belarusian firms to manufacture such equipment. But these attempts obviously were not welcomed by the national army. It apparently did not buy any of the vehicles. That occurred despite public statements by the Belarusian president about the introduction of Belarus-made weapons. Most exercises conducted by the Belarusian army involve drills carried out jointly with Russian counterparts. The largest took place on 10-16 September, when Belarus and Russia conducted an operative military exercise called “Shield of the Union-2015” on Russia's territory. More than 8,000 personnel of both countries took part in the drills which included operations by the air force, air defence, infantry and other units. On 2-5 September, Belarusian special forces took part in a joint tactical drill called “Slavic Brotherhood-2015” with Russian and Serbian special forces near Novorossiysk (Russia). On 30 September-4 October Belarusian Special Operations Forces participated in a military exercise called “Unbreakable Brotherhood” of the Collective Security Treaty Organisation (CSTO). 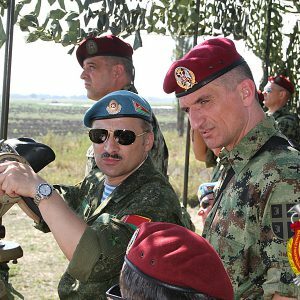 The exercise took place in Armenia and involved military and police units of all the CSTO members. On 22-24 September, the 61st Fighter Airbase conducted exercises involving the landing of MiG-29 fighters, An-26 transport aircraft and Su-25 close air support aircraft on a road. Minsk claimed that nobody has ever done that with an An-26. Representatives of the Chinese army attended the exercises. Minsk avoids risks related to the conflicts in Ukraine and Syria. On 22-24 September, representatives of Belarus' and Ukraine's armed forces came together in Kyiv for a working meeting to assess the implementation of the Belarus-Ukrainian Agreement on Additional Confidence- and Security-Building Measures in 2015. The representatives also discussed bilateral cooperation in 2016. On 2 October, the Belarusian State Military Industrial Committee announced that no Belarusian specialists were currently working for the Syrian government. On 17 March, BuzzFeedNews published a story about the reexport of 700 old Konkurs anti-tank missiles from Belarus through Bulgaria to the US-funded opposition in Syria. The news lacked any proof and many details, such as the time of the transfer. Furthermore, it was published by a web-site which usually does not write about such issues. Nevertheless, it could be true. Earlier this year, Reuters wrote about an undisclosed UN report accusing Minsk of supplying ammunition to some Libyan forces backed by conservative Arab regimes allied with the West (above all, the traditional Belarusian ally, Qatar). Belarus since the early 2010s refocused its foreign policy in the Middle East from relations with the West's opponents (for example, Libya, Syria, Iran) to the West's allies (like Qatar, UAE, Turkey). Also in September some authoritative Russian military bloggers like Alexander Ermakov revealed that Belarusian firm Transaviaexport was transporting military cargo for French forces participating in airstrikes in Syria. The reports concern the flights in August and September and are partially confirmed by the French Defence Ministry.